Creator Shepard Fairey’s Andre graphic was posted all over the world. It was the type of “word of mouth (for lack of a better term)” that graphics don’t see every day. The one thing I always wondered was if Vince McMahon and the World Wrestling Federation (now WWE) ever sued Fairey for any copyright issues. After all, I’m sure the initial photo of Andre was property of the WWF. They did and this caused Fairey to stop using the name Andre The Giant and later modified the look of the graphic to what we now know as OBEY Giant. While I certainly enjoyed his designs, does Fairey really have the right to complain? After all, he did use photos of Andre the Giant and later Barack Obama that were not his. He used these photos to enhance his art and messaging. While Orr’s idea was uncreative, perhaps he felt the same in his intention. In the days of advanced technologies and people being empowered to remix songs and editing videos, can the same apply to art? Is this piracy? I think not and as American academic and political activist, Larry Lessig says, “creativity is being strangled by the law.” He goes on to say that the television and music that his generation had is now being created by today’s generation. The film, Steal This Film II, reiterates this thought process too. The read/write culture enables us to recreate media to say things differently. I do not see this as “stealing,” but expressing yourself through another person’s art. What if library’s decided not to let us take out books for writing papers and learning? What’s the point of creating them in the first place? For profitable gain (which Orr did do), building your bank account off someone else’s creation is wrong. However, if you have a passion for what you do and are paying an homage to someone’s work, who are we to say who’s a parasite and uncreative? Did Shepard Fairey really intend on sending a message or did his tracing of an Andre the Giant photo catch lighting in a bottle that was interpreted differently by the masses? Did he intend on creating the OBEY graphic to make money? Maybe so, maybe not, but we remember it and it is still considered art. 1990s, The Early. “Andre the Giant Has a Posse.” Wikipedia, the Free Encyclopedia. Web. 21 July 2010. 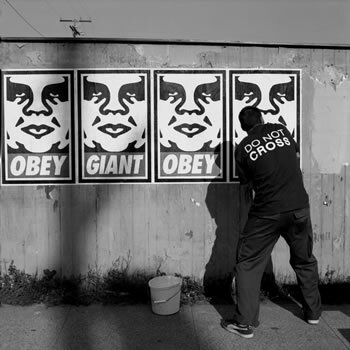 <http://en.wikipedia.org/wiki/Obey_Giant>. “Module 9 – The Search.” The Interactive Voice. Web. 21 July 2010. <http://interactivevoice.blogspot.com/2010/07/module-9-search.html>. Steal This Film II. Web. 21 July 2010. <http://www.stealthisfilm.com/>. “Larry Lessig on Laws That Choke Creativity | Video on TED.com.” TED: Ideas worth Spreading. Web. 21 July 2010. <http://www.ted.com/talks/larry_lessig_says_the_law_is_strangling_creativity.html>..